I know there are two outstanding updates on this blog, namely updates on the house renovation and the brick oven construction in our courtyard. Well, the house is practically finished, with just a few details left, the most important of which is the internal staircase which will connect the ground and upper floors. The metal staircase structure which will support the steps is being assembled and I’m hoping it will be installed this week. In the meantime we’ll be busy varnishing the wooden planks which will be used as steps this week. A more detailed update on the house is coming soon! 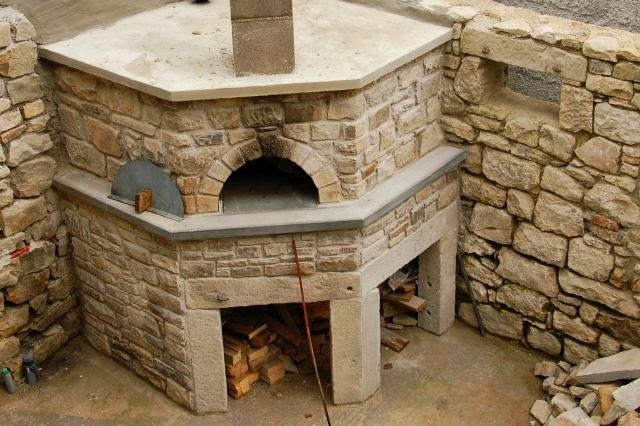 As for the brick oven, it’s now complete and fully functional and has produced many yummy breads and pizza. As you may have read in a previous post, the brick oven has been the Belgian husband’s pet project for the past few months. I’ve been itching to write an update about it for some time now but I was asked by the brick oven maestro to wait until he completes the informational website he has created detailing the entire construction process. That was almost two months ago… and after a few reminders and a final decision that I was writing the update brick-oven-website-ready-or-not, the website was magically completed and I can finally write this post and share the website link with you (see below). The brick oven project was started at the beginning of May and completed towards the end of October, with many breaks in the construction process due to (rainy) weather, a bit of travel, and injury (nothing too serious, just a few sore arm muscles and back strain). Our brick oven is a subject of curiosity in the village. Many people stopped by to have a look during the building process and offer their advice (solicited and unsolicited – mostly unsolicited – everyone had a say!). We also heard a lot of stories about the olden days when the village had three or four functioning brick ovens – some of these were public where villagers could come to bake their bread. At Easter time women would walk here from neighbouring farms and villages with loaves of sweet bread to bake in the communal oven. My aunt told me she would accompany my grandmother, balancing on her head a large wooden kneading board covered with loaves ready to be baked. One of these old ovens is still left but is not in use – it is actually very close to ours, in the next property just over the back wall. Nowadays everyone has an electric oven of course, but there are some people who build a brick oven specially for baking pizza and bread. Nothing compares to a pizza baked in a wood-fired oven! As for the experience, the Belgian husband says it was definitely worthwhile and greatly rewarding (culinarily rewarding too!). He shares his research, 3D models, mathematical formulas, photos and experiences on almost every detail of the brick oven building process at The Brick Oven. Tone will love this... "Somewhat" more scientific approach than his :) Cannot wait to compare our pizzas! that oven is amazing! I looked at the LINK to the Blog with the detailed step-by-step instructions from "The Belgian Husband", and hats off to you!! compliments! seems like an engineer, a labour of love certainly... I wish I had such an amazing oven (or husband....)... for my pizzas and bread.. I am sure you will enjoy it and use it very much!